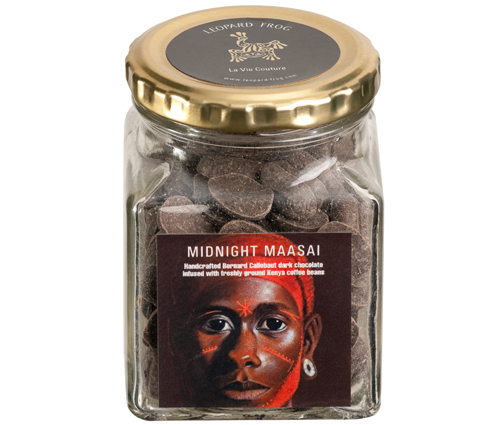 Midnight Maasai combines Bernard Callebaut Belgian dark chocolate with freshly ground Arabica coffee from the highlands of Mount Kenya (home of the Maasai) into bean shaped chocolates that deliver a robust chocolate experience. Mouth-watering dark chocolate with freshly ground Arabica coffee beans that deliver a robust chocolate experience satisfying to the mind, body and soul. In Saudi Arabia, a wife can divorce her husband if he does not give her coffee. Dark couverture chocolate (>56.8% cocoa), cocoa mass, cocoa butter, emulsifier, soya lecithin and ground Arabica coffee beans.